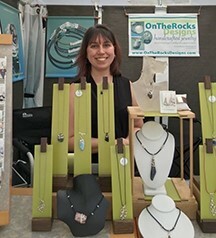 Founded in January 2007, “On The Rocks Designs” focuses on creating one-of-a-kind, artisan jewelry. The name was inspired by me lamenting changing my name when I got married. And when I heard the commercial for the liqueur “Disaronno” on the rocks, it sounded so similar to my maiden name Lisa Wrona, I was inspired. I decided at that point that my name was “On The Rocks”. My business name pays tribute to the artistic heritage of my family’s talents and namesake. Each unique handmade jewelry item is named after a drink or a cocktail related theme.